When his grandfather’s dementia raises the specter of foster care, Arlo flees to find his only other family member in this genuine, heartening novel. Arlo’s grandfather travels in time. Not literally — he just mixes up the past with the present. Arlo holds on as best he can, fixing himself cornflakes for dinner and paying back the owner of the corner store for the sausages Poppo eats without remembering to pay. But how long before someone finds out that Arlo is taking care of the grandfather he lives with instead of the other way around? When Poppo lands in the hospital and a social worker comes to take charge, Arlo’s fear of foster care sends him alone across three hundred miles. Armed with a name and a town, Arlo finds his only other family member — the grandmother he doesn’t remember ever meeting. But just finding her isn’t enough to make them a family. Unfailingly honest and touched with a dash of magical realism, Sarah Sullivan’s evocative debut novel delves into a family mystery and unearths universal truths about home, trust, friendship, and strength — all the things a boy needs. Sarah Sullivan is the author of Dear Baby: Letters from Your Big Brother and Passing the Music Down. This is her first novel. Sarah Sullivan has an MFA in writing for children from Vermont College and lives in West Virginia. There’s no pretension in this simple but deep story... A playful air of mystery hangs over the second half of the novel, and there are even tinges of a good ghost story... Art history buffs will especially appreciate the fact that the final reveal involves a long-lost painting, but the carefully detailed development of a boy learning how to deal with being caught in-between will appeal to a wide range of readers. A quietly affecting coming-of-age story about finding family and confronting change. Some suspense, much heartache, a few tears, and smiles all tie together nicely in the end to create an outstanding debut novel. Intriguing... suspenseful... [R]eaders will root for this youngster as he works to create a place he can call home. Sullivan’s debut novel beautifully balances the big issues in Arlo’s life with his smaller, more immediate concerns: his dog, an adventurous friend, and the magic of a wooden eagle carved by his father. The characters’ race is often left ambiguous, allowing readers to envision for themselves. Filled with heart, this will appeal to fans of Kate DiCamillo’s Because of Winn-Dixie or Eva Ibbotson’s One Dog and His Boy. This title is actually several books in one. It is the story of a boy and his grandfather dealing with Alzheimer's disease; the story of a boy trying to locate his long-lost family; and an adventure. It is ultimately a ghost story, a mystery uncovered through the world of art history. In her debut work, Sullivan gives the reader vicarious experiences and feelings of the importance of home, the value of true friendship, and the strength of one's convictions. Sullivan artfully captures Arlo’s feelings of uncertainty and his fervent wish to create a stable home life for himself. Additionally, the author’s handling of Alzheimer’s disease and its devastating effects on families is compelling. [Middle-grade] stories can be so rich, the characters so irresistible, even for an adult reader. 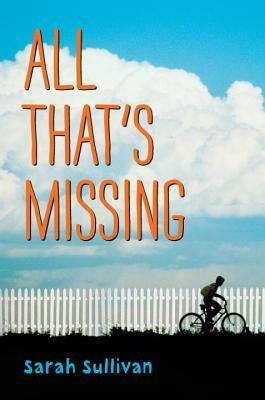 So it is with 'All That's Missing' ... which deftly captures the complicated workings of an 11-year-old mind caught between the confidence of youth and the vulnerability of adolescence. It’s rare to find a quiet, reflective middle-grade novel with a boy as the main character, and rarer still to find one this satisfying. ... With touches of magical realism, and a crime caper thrown in for good measure, this gentle book explores how every family has some question nobody wants to answer.